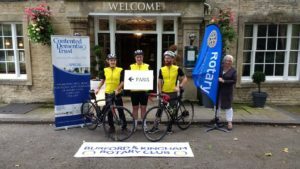 We are proud to announce that three members of the Rotary Club of Burford & Kingham have successfully completed their challenging charity cycle ride from Burford to Paris in aid of the Trust. Club members, John Smith, Stuart Jackson and Mike Lynes were supported by Stuart’s son-in-law, Phil Dowling, a proficient cyclist. As of writing £1,280 has been raised as a result of this sterling effort. John, Stuart and Phil took on the four-day challenge from 27th to 30th September with Mike manning the back-up vehicle. This is their 3rd charity bike ride to Paris out of a total of no less than five. The three cyclists all completed the full distance and were greeted in Paris by their twin Rotary Club of Savigny Val d’Orge. Phil also managed to document the whole experience on camera with regular updates posted to the Rotary Club’s Facebook page. They enjoyed a pleasurable evening with their twin Rotary Club and we are very appreciative of the very generous donations made by their members, members of the Rotary Club of Burford & Kingham and the friends and family of all those who participated. Four and a half marathons in support of Contented Dementia Trust!